A gift from the eNGalleria can be considered 'Seva' (the spirit of service) because it reaches out to a new soul, transforms a new being and contributes to global peace. Read More..
eN-Kriya is an enlightening meditative process aimed at individual transformation that leads to increased consciousness at a societal level.Read More.. The word 'darshan' can be roughly translated as 'vision'. Darshan is used to describe the holy sight of a saint or enlightened being. 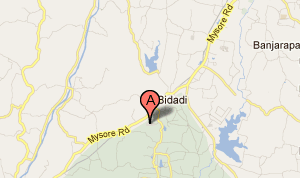 Read More..
HOW DO I GET TO BIDADI ASHRAM? An ashram is created by the direction and pure elegance of a living enlightened master. Every area of the ashram the master’s blissful energy can be felt in addition to the blossoming energy of the disciples and devotees due of the long hours of spiritual practice. The ashram is equipped with accommodation for all ages and to basic comfort levels. Apartment Style and Dormitory accomodations.